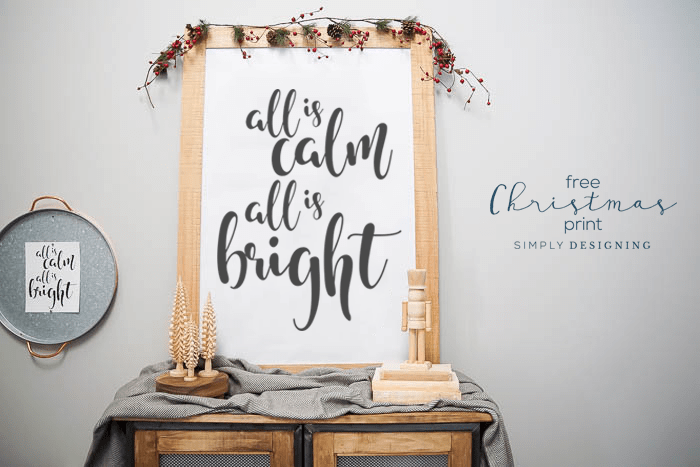 I am so excited that Christmas is just around the corner and so today I am sharing our easy and affordable Farmhouse Christmas Decorations plus a really fun, service-orientated Printable Countdown Calendar! 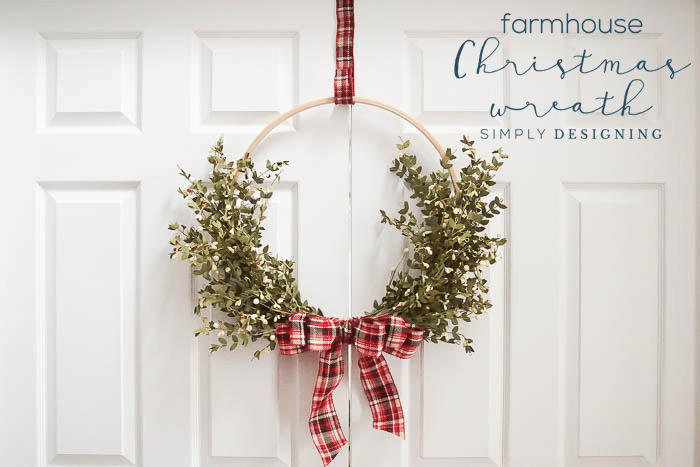 If you love Farmhouse Holiday Decor, you should also check out my Farmhouse Christmas Wreath HERE. My farmhouse wreath is actually in my family room and so you may catch glimpses of it in today’s post! 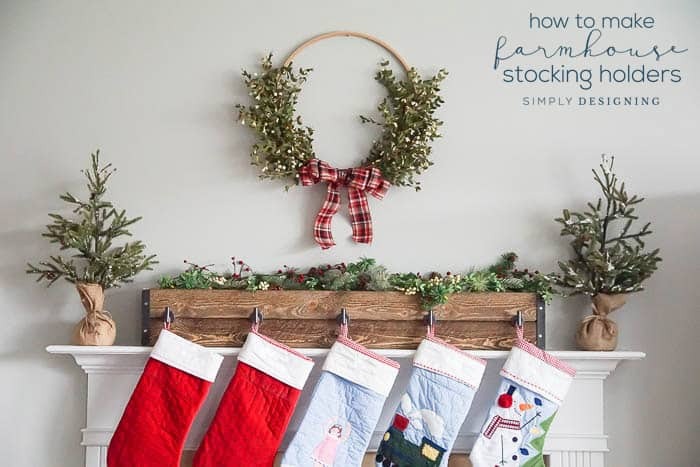 Keep reading for all the details, free printable countdown calendar, and sources for all my farmhouse Christmas decorations. And to make this post extra fun, I have hidden an Elf on the Shelf in one of my photos! If you can find it, comment on which photo it’s hidden in in a comment below! This year for my Christmas decorations, I wanted to keep things consistent with our industrial farmhouse look that I love so much. A little rustic element here and there, a little galvanized metal, simple patterns and colors but a whole lot of style and holiday spirit. I am re-using things that make sense to re-use, and adding things where a bit more holiday spirit is needed! And the end result is a beautiful, simple Farmhouse Christmas family room. My furniture in my family room is fairly neutral, a dark grey sofa and light grey chairs. 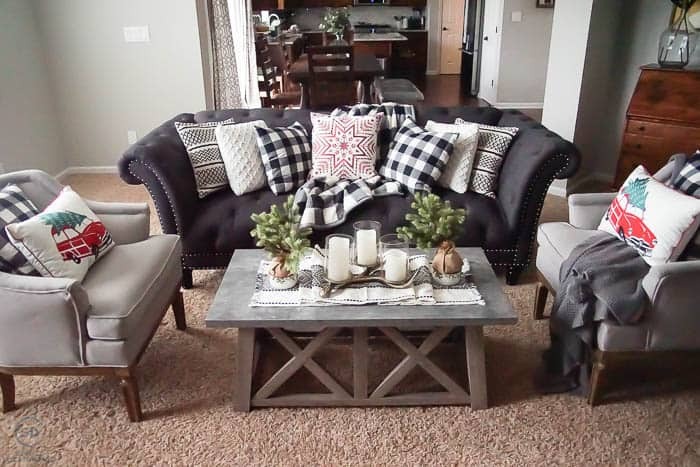 Last month I added a beautiful coffee table and some simple yet stunning black and white pillows to the room. You can check out my Fall Family Room Update HERE. For my Christmas Family Room Update, I was able to re-use a couple of the pillows, but I swapped out most of the pillows, the throw blankets, added a few more decorations and the result is a beautiful Farmhouse Christmas look. Let’s chat about the changes I made. On my Granary Modern Farmhouse Coffee Table, I added a Black Tapestry Table Runner. I scrunched it and folded it a bit to fit on the table better, but I love the simple black and white pattern and it works perfectly with my Farmhouse Christmas theme! 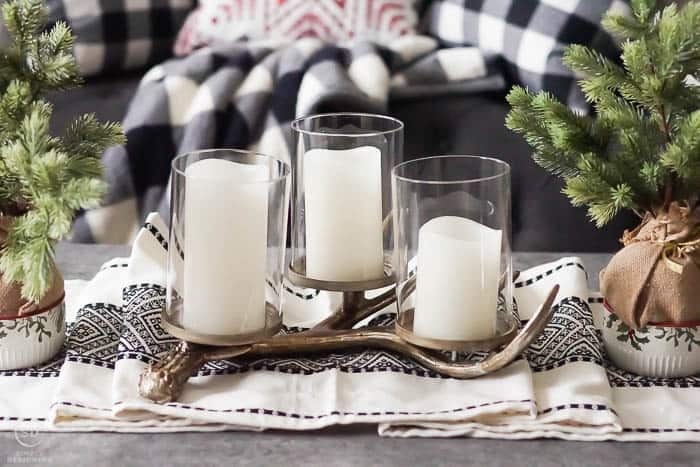 On my coffee table, I placed an Antler Centerpiece with pretty Flameless LED Pillar Candles in them! (I have several sets of these by the way and I LOVE them!) I don’t burn real candles in my home, but I love how these Flameless LED Pillar Candles give off a warm holiday feel. On either side of the candle holder, I added the cutest Heritage Ramekins ever! 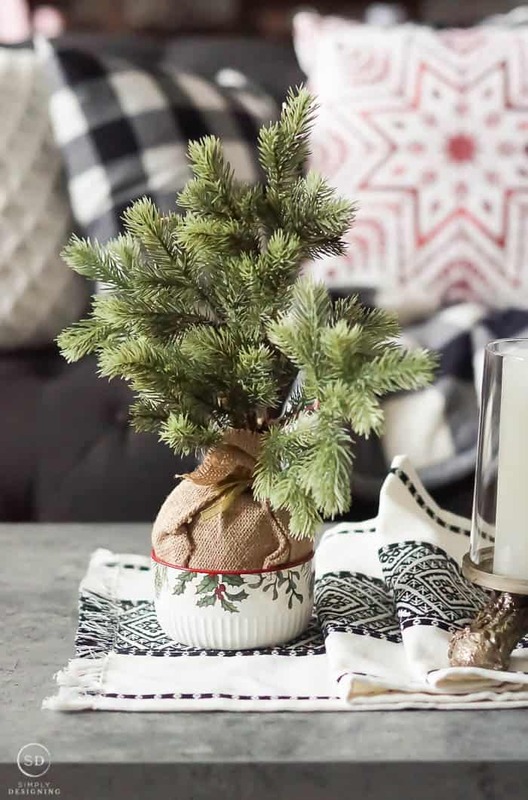 I decided that they would be really cute holders for faux evergreen trees. I just love the touch of color and pattern on my coffee table without feeling like too much. My side chairs are the perfect place for a throw and a few pillows! 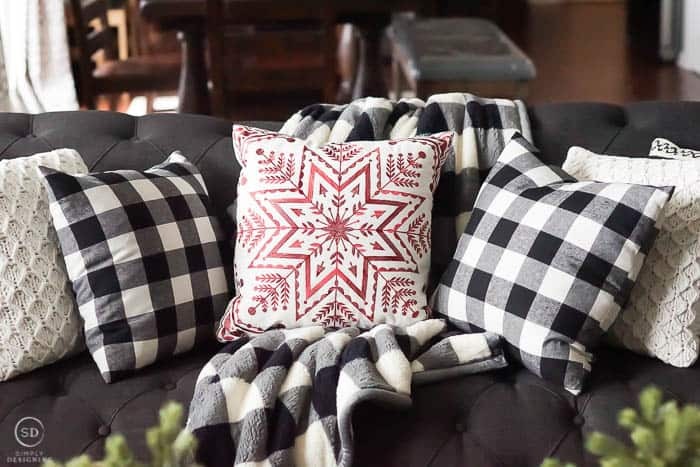 I placed a Knit Pom-Pom Throw Blanket in grey, a black Buffalo Check Decorative Throw Pillow and a Retro Car Pillow on one side chair, and a black Buffalo Check Decorative Throw Pillow and a Retro Car Pillow on the other side chair. So super cute. 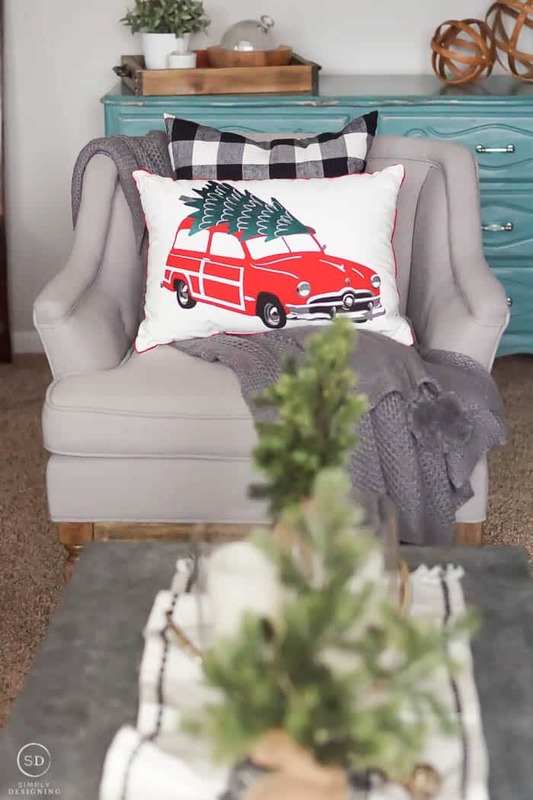 I will admit that the accent pillows with the red car and Christmas tree on them are super cute and I love the rustic feel it adds to my room. I mean…seriously! So super cute. 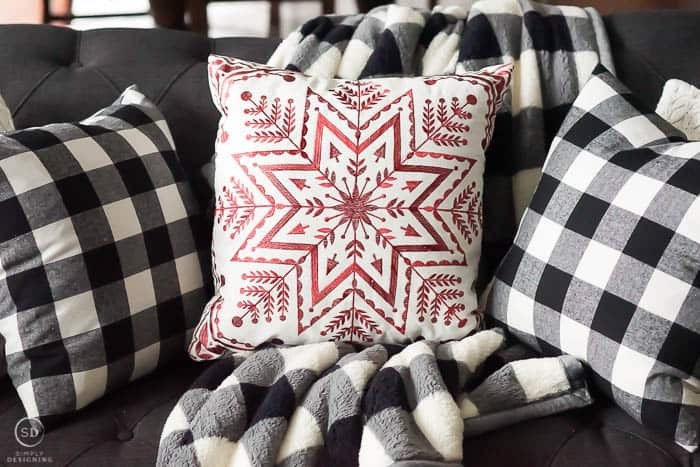 On my couch, I kept my Striped Chevron Diamond Decorative Pillows and my Knit Decorative Throw Pillows, but I added two black Buffalo Check Decorative Throw Pillows and one Deco Snowflake Pillow to add a little holiday style and pop of color! Does buffalo check just say Christmas to anyone else!? I think it is the perfect holiday pattern. 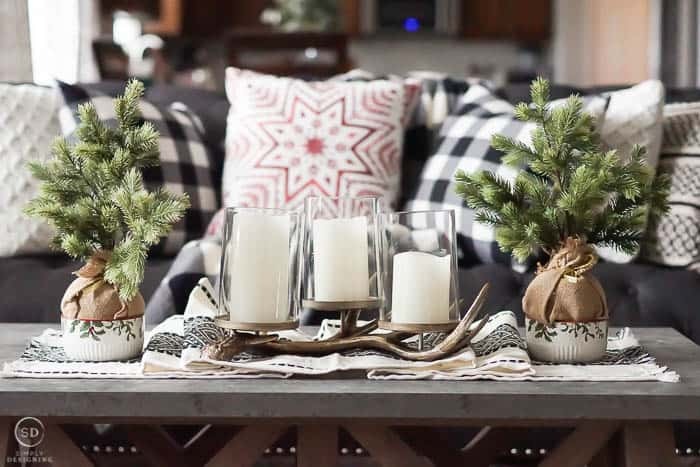 The Printed Sherpa to Sherpa Throw Blanket in Black Buffalo Plaid on the back of the couch is so incredibly soft and warm and I love how it adds a soft holiday touch to the space. Next to my Christmas tree, I placed three Galvanized House Candle Holders! Oh my goodness I can’t get over how cute these are. 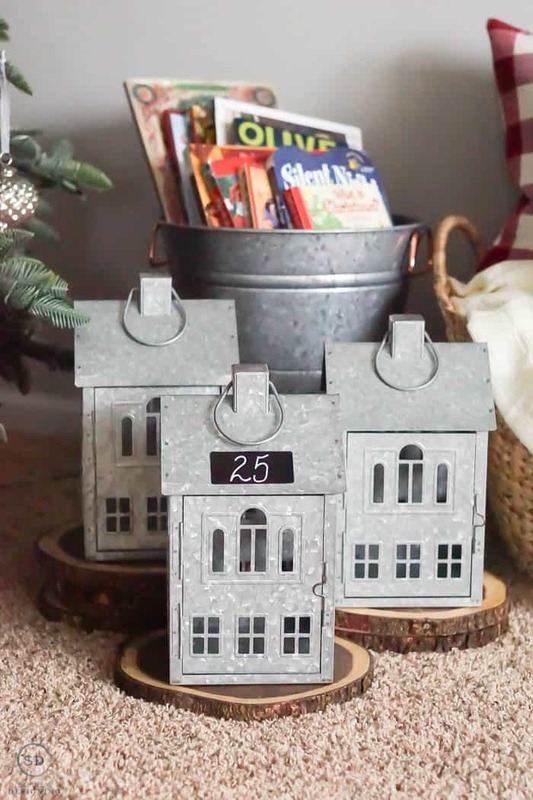 I think they are perfect for everyday farmhouse decor, but at Christmas time, they just add the perfect homey farmhouse feel to the space! I placed them on Acacia Wood Bark Chargers that I snagged last year. 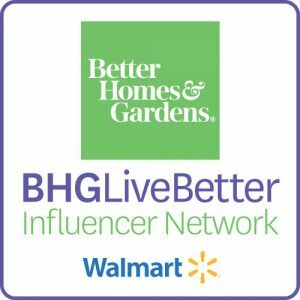 They were part of the Better Homes & Gardens line sold exclusively at Walmart. And stacking the lanterns on the wood slices gives the lanterns a fun staggered height. And I added a chalkboard sticker to one of them! Although you could definitely add a chalkboard sticker to all three of your lanterns if you prefer. I decided instead of using these as traditional lanterns with candles in them, to use them as a countdown calendar. The chalkboard sticker will serve to help us countdown to Christmas. And every day, inside the lanterns, will be a note card with a task to complete! Service is so important to our family, and I want to instil in my children a love of serving others. So I came up with 25 easy, service ideas for children (or adults) to complete as a countdown to Christmas for the month of December. 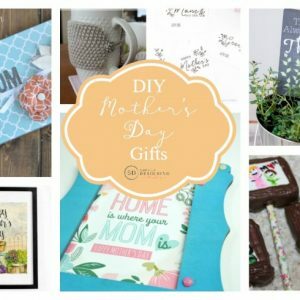 These ideas are all really simple and can easily be completed in a few minutes, but my hope is that my children will grow to love serving, even more, this time of year. You will be able to download this free printable countdown calendar towards the end of my blog post. Countdown Calendars and Service are both huge parts of our Christmas holiday tradition. Some years I get the little chocolate countdown calendar, and some years we do something more extravagant. But every year we have a way we countdown. And every year, we try to come up with ways to serve. Sometimes we deliver treats, sometimes we deliver Christmas meals, or sometimes we do things secretively. Last year we did a fundraiser at my kiddos school to raise funds for Lifting Hands International to buy a goat for a refugee. It was such an amazing experience and we were so blessed to be able to see so many funds raised for this program. You can read more about it HERE. Having traditions like counting down to Christmas and serving others is a wonderful way to bring my family together around the holidays and it definitely helps to keep the holiday spirit in our hearts and homes. 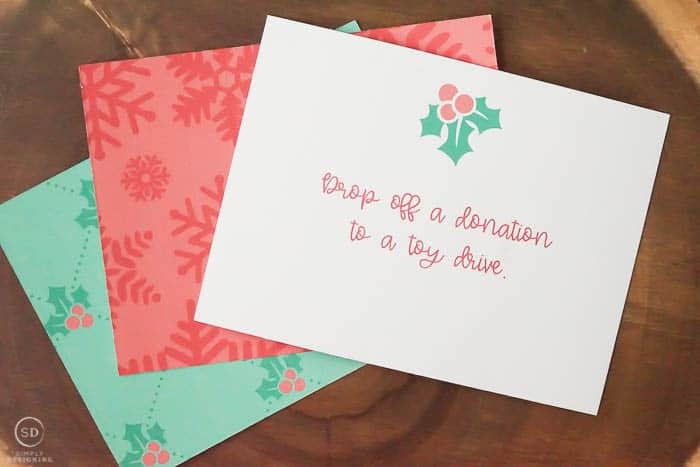 These are two ways we help to keep the holidays Merry! 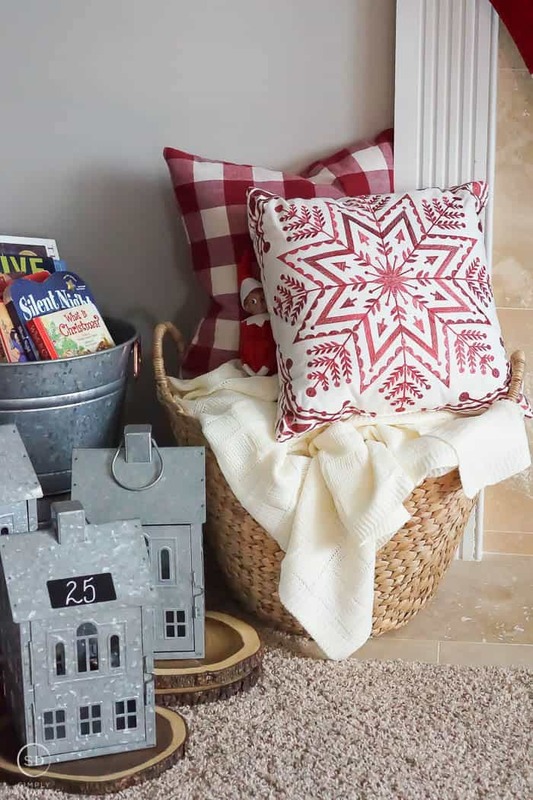 Next, to the Countdown Calendar lantern display, I added a beautiful and warm Cream Chunky Knit Throw, a Feather Filled Buffalo Check Decorative Throw Pillow in red, and a Deco Snowflake Pillow onto a basket I always keep next to my fireplace. And behind the lantern display, I put our Christmas books in a Galvanized Round Tub with Copper Handles, stacked on top of a second tub, that I purchased earlier this year. I love reusing buckets, baskets and bins throughout the year for multiple purposes. I love having extra pillows and blankets on hand and easily accessible for our family and guests to grab and use whenever needed. 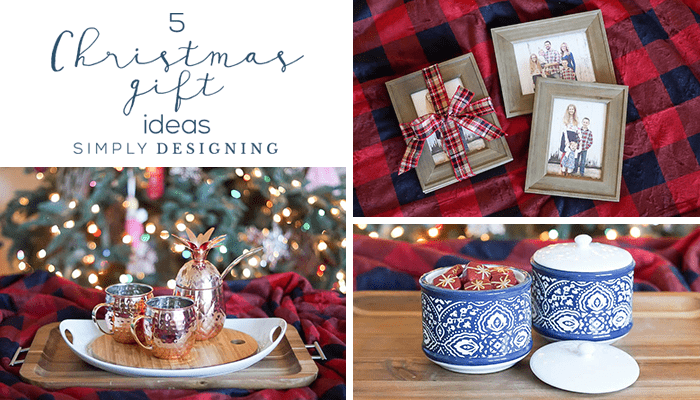 I am really in love with my Farmhouse Christmas Decorations this year! My family room Christmas decorations are so fun, simple, yet perfectly US! 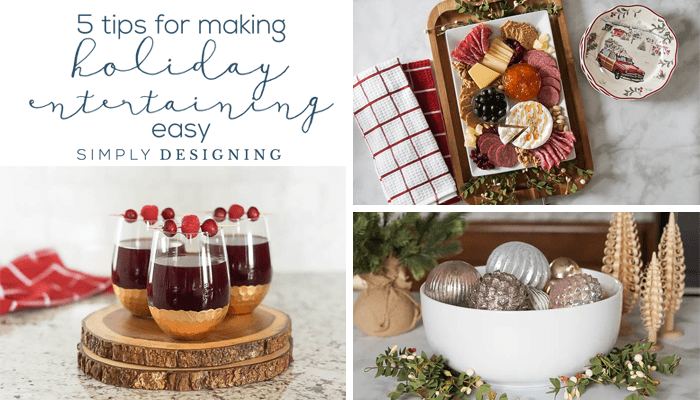 However you decorate for the holidays, I recommend keeping things simple and in-line with the style of home decor you already love and have in your home. 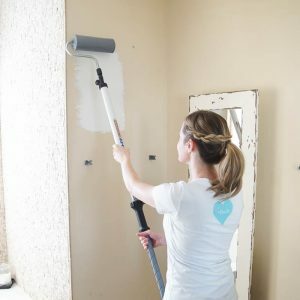 This will make transitions and decorating so much easier. The Elf on the Shelf is hiding in the picture with the Countdown Calendar lantern display, the Cream Chunky Knit Throw, a Feather Filled Buffalo Check Decorative Throw Pillow in red, and a Deco Snowflake Pillow on a basket next to fireplace. I am doing white and black buffalo check for my Christmas theme as well. I feel very inspired looking at your decor. The special fold you created on your coffee table is going to be a new trend setter. I LOVE IT! Pinning to my Buffalo Check Christmas Board. I found the elf behind the. Cute snowflake pillow! Cute! I LOVE everything! Some of it has a Scandinavian feel which is my favorite. So pretty yet simple.